Also Recommended: Princess Mononoke, Green Legend Ran, Origin: Spirits of the Past. Notes: Based on the manga by Miyazaki Hayao, available from Viz. The Second Editor-in-Chief holds that the official THEM line is that Nausicaä is indeed wearing pants. Or trousers. Or whatever you call them. A thousand years ago, the "seven days of fire" tore the world apart and left nothing but poisonous lands behind, save for a few carefully upkept spots of livable land left. One of the smaller patches goes under the name of the Valley of the Wind, where we find Nausicaä, the daughter of the dying village chief. With her trusty glider, she flies around the poisoned lands, looking for items that will help her village, but also something that will help her to get to the bottom of the whole situation with the poisonous forest. But there are those who do not seek peace, and a horrible secret resting underneath the valley may very well spell doom for all of humankind. 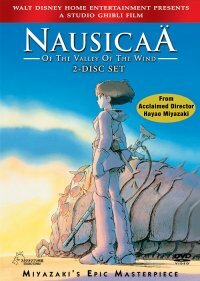 Nausicaa was not the first Ghibli movie I ever watched. The studio's impression had long since been left with me by My Neighbor Totoro, which I recorded from a Swedish TV channel and kept in my collection up until I could get the movie on DVD. Nausicaa is one of the first Ghibli movies I watched with a clearly set enviromental message, though, which kind would not be repeated until later, when I had the chance to pick up Princess Mononoke. Nausicaa is also one of Ghibli's first movies. In fact, from what I can tell, this movie might very well be the one whom Studio Ghibli owes its international fame. It's starting to show its age, that much I feel is true, but this will only become a problem depending on how much of a style junkie you are. Unlike Princess Mononoke, however, Nausicaa takes place in a distant future, where the world has been torn apart by war, or, to be more specific, by a race of giant beings who burned the forests and the lands to the ground, and after a thousand years, nary a thing has been left but poisonous plants spewing their spores around as they lay waste to one village after another, or the rich wildlife of insects of various sizes -- some of them positively gigantic -- who seem unaffected by the poison. In the middle of this, we find our heroine, Nausicaa, as she flies over the lands, searching for an Ohmu shell in the curiously fuzzy plantlife. Her mode of transportation seems to be a jet-propelled glider with handlebars mounted on for ease of control, and she flies it like one would a hangglider, if the pilot was balancing on top of it instead of underneath. Once she secures her Ohmu eye lens after finding the huge shell, she hears a ruckus in the distance, and finds someone being followed by a very alive -- and very irate -- Ohmu. She hops on her glider to intervene, and actually manages to calm the colossal insect down, only to find that the person she rescued is none other than the old swordmaster Yupa. Together, the two return to the village and the story can start proper. Before I go into the story and the characters, though, I want to talk a little about the world and the creatures living in it. In Nausicaa, most of the animals are actually insects, and positively gigantic ones at that. The Ohmu, for instance, are as large as a five story building (at least), built like a tank and with a collection of flailing legs coming out in front for the purpose of moving around, and to say they look impressive by themselves when onscreen is an understatement, to put it mildly. Even though they're mostly benign by the standards of the movie, you don't want to be caught in front of a raging one, much less a whole stampede of them. They're hardly the only bugs around, though. Many of them are capable of flight, thus having the potential to be a danger for larger airships. Even the smallest among the bugs outsize even the Asian Giant Hornet by a wide margin, so it's more than likely that the continued survival of the human race can be attributed to most of them not being particularly aggressive. The overwhelming amounts of insects can probably be attributed to the fact that the world mostly consists of forests that looks like they're covered in moss and spores, which constantly belch out a poisonous fume that demands any human being -- or any animal, for that matter -- to wear a mask, and even that is a limited protection method, as the movie makes it clear that even with the mask, spending more than a day out in the world is ill advised. There are some safe spots, though, like the valley where Nausicaa lives. Being out by the sea, the breeze that flows through the valley serves as a protection against the spores that contaminate the nature, and the inhabitants take care of whatever minor problems that may appear with flamethrowers. It is here that we're thrown into the life of Nausicaa herself, our main protagonist of the movie, and possibly the only real problem I had with the film itself. Yes, I said "problem", and I can almost imagine quite a few of you out there raising your eyebrows as you read this. Strong female leads are hardly anything new in Ghibli movies. In fact, I dare say this is one of the things Studio Ghibli does best of all. The thing about Nausicaa, though, is that I personally feel they take her role a bit too far. Apparently, she's the only one in the valley who actually journeys out into the poisonous forests, and not only that, but we quickly learn that she possesses a wealth of gifts; from the way she found out how to tame the Ohmu, to the fact that she's got a pacifist streak a mile wide, even when her village is invaded by soldiers in a raid that basically trashed large parts of their safe haven, setting all the villagers at risk. We later learn that she's been working hard in trying to figure out just why the forest is poisonous, and if something can be done with it. Maybe I'm being a little bit unfair, though. It's not as if it's the character of Nausicaa herself I have a problem with, but more with how the movie portrays her. In addition to all her work, she basically looks after the whole village in her father's stead, and when she's not there, she can be counted on for running around and solving everyone else's problems. I'm sorry, but I do find it a little bit odd that Nausicaa's village is full of capable people, except they seem to have a bit of a problem with doing village stuff on their own without her personal intervention. At least as far as anything outside their regular work schedule. Also, she's got a secret lab where she's trying to work out the trouble behind the poisonous plants, and yet she couldn't find capable help in her own village with this? And even outside of her borders, people she just met will be more than willing to throw away their lives for her sake. She cries tears for mistreated Ohmu newborns while apologizing profusely for the actions of others, and her potential death has the power to mortify people into dying willingly for no particular reason. It's also possible she can walk on water, but that's an unproven fact as of yet. Yeah, I'm complaining about a Ghibli movie. If any armored horsemen are seen in your area, that's... probably my fault. Sorry about that. It's not like I dislike the movie or anything. Far from it! Even if I find the heroine somewhat insufferable at times, this is still a great movie. Even if it's a heavily abridged version of an even more grand manga, it's still a great movie. Even if the princess takes center stage a little too often to my liking, the rest of the cast are still a lovable bunch. In comparison, the Tolmekians might come across as a bit warmongering and villainous at first, but even they are portrayed as having a not entirely unsympathetic leader in Kushana. The whole movie is played out not unlike how I imagine people would act out in a war situation, and as reprehensible as some of their actions are in this less-than-subtle storyline, they do come across as more of an act of desperation than something people would do out of pure malice. Partial malice, maybe, but not pure. Earlier, I compared this anime to Princess Mononoke, and, in all honesty, I'd chose that one over Nausicaa if I had to make a choice between the two. It wouldn't be an easy choice, but I think Princess Mononoke manages to see the same issues from a more objective stance, and the movie is a little bit better for it. That said, I do not regret picking this movie up at all. It's definitely worth it to see this strange, spore-covered world in all its venomous glory. It's worth it to see this large community of insects that make up the majority of the wildlife in it. And it's worth it to see where Studio Ghibli got their first major break. Recommended Audience: Miyazaki's flicks are mostly good for general audiences. However, this movie does involve war, and quite a few (relativlely clean) deaths happen on screen. Little kids might get spooked by the insects of the Sea of Corruption, and the wind tends to blow a lot, occasionally blowing Nausicaä's skirt up a bit (I guess underwear was one of the technologies lost to the Seven Days of Fire). Should be okay for most audiences, though.